Instead of attending traditional institutions, students will access books, lecture videos, and digital learning environments through the Internet. Technology, specifically artificial intelligence aided by massive amounts of educational data, will enable personalized learning experiences for individuals at a reasonable price. Traditional college credentials, according to Carey, will fade into memory. He notes that the American university is a three-headed hybrid designed to meet the needs of researchers while paying little attention to teaching undergraduates. Its flaws have been obvious to anyone paying attention, but the intellectuals running the “hybrid universities” have seldom acknowledged them. American colleges and universities were able to hide their weaknesses by a confluence of factors; the decades-long run-up in the value of college degrees for the labor market, the expansion of white-collar workforce and contraction of blue-collar manufacturing jobs, the cessation of physical campus expansion in the 1960s (primarily community colleges), and the advent of the U.S. News & World Report ratings system. The U.S. News rankings, first issued in 1983, created an opportunity for a new kind of college president, one more attuned to the increasing market demand for a college education. Carey writes about the advances of Boston University during this era under John Silber and subsequent growth of the University of Hartford and George Washington University under Silber’s former lieutenant, Stephen Trachtenberg. The success of these institutions led to many others emulating their model. The addition of buildings, deans and departments, Ph.D. programs, athletic teams, and fancy student accommodations allowed hybrid universities to increase the sticker price without resistance as their status improved. Unfortunately, all of these added costs made college much more expensive than necessary if it focused on teaching undergraduates. Carey writes about multiple advances in the scholarship of learning, citing Stanford University, Carnegie Mellon University, and the Massachusetts Institute of Technology (MIT). For example, Carnegie Mellon’s Open Learning Initiative (OLI) married the science and theory of learning with computers, building digital learning environments responsive to the actions and neural patterns of individual students. Surprisingly, despite being offered to other colleges for next to nothing, very few adopted it. According to Carey, “colleges and universities do not want to be more productive, and will do whatever they can to avoid such a fate.” They get away with it due to public subsidies of higher education and regulations that require conformity. Carey takes readers from the halls of Stanford, CMU and MIT to Silicon Valley, where we are introduced to a venture capitalist, Mike Maples, Jr. Maples, a fan of Clayton Christensen, describes companies built to disrupt a market as “thunder lizards.” At $4.6 trillion in market size, education is largely an analog business, well-positioned for digital disruption, and much larger than other markets disrupted by technology. As Carey describes a few of the Silicon Valley area businesses established to provide lower-cost textbooks, study rooms, coaching, fundraising, learning aids, etc., he states the obvious – that the hybrid university is being steadily undermined by technology-enabled startups and the likelihood of the University of Everywhere becoming a reality is growing exponentially. Carey notes that the most successful entrepreneur models in Silicon Valley are platforms. The hybrid university has served as a platform, one where students seek knowledge, skills and credentials and scholars earn a living while pursuing research. The university doesn’t need to worry about which courses are offered or whether they’re any good; that’s up to the buyer and seller. It simply builds the platform and takes a percentage of every sale. Continuing with the platform discussion, Carey recalls a discussion with Coursera co-founder Daphne Koller about her five-year goal to build 5,000 MOOC courses. Citing a U.S. Department of Education statistic that one-third of all college credits earned by people with bachelor’s degrees come in 30 courses, Carey notes that 5,000 courses is likely to cover most college courses, hosted on a single platform, with the potential to earn a profit on a course that returns low revenue per student. To make a case for the University of Everywhere, Carey disparages the current credentialing system offered by colleges and universities. He recommends badges, as developed by the Mozilla Foundation and others, as one of the tools to replace diplomas. The Mozilla badge contains a lot of digital information unique to its recipient, including a portfolio of accomplishments. So, too, do the certificates of completion for EdX and other MOOC courses. Carey maintains that colleges and universities and companies that can design rigorous courses aligned to corporate or industry standards will succeed in attracting worldwide intelligent students who are eager to demonstrate their ability to learn and master the subject. These credentials will be part of the University of Everywhere and will be inexpensive, allowing people to display information about themselves in new and powerful ways. Carey proposes that as digital learning increases in scale, the sheer number of people learning online will influence the quality of instruction, learning and outcomes. Existing colleges and universities (hybrids) don’t understand the affordability implications of scale on a digital level. Course development costs are dramatically less than the cost of buildings. Carey believes that the University of Everywhere will emerge while, not after, current millennials mature. Organizations competing for students will include some existing colleges and other nonprofits and for-profits yet to be created. All of these organizations will incorporate artificial intelligence (AI) into their course designs, which will allow them to personalize the education according to the individual’s learning strengths and weaknesses. All of this will lead to an expansion of higher education at a lower cost to individuals who were previously unable to access or afford it. Carey writes, “the future of higher education is one in which educational organizations shrink back to a human scale. They will be big enough to form authentic communities and not so big that interpersonal connections are overwhelmed.” I disagree, as this last statement directly conflicts with the platforms’ efficiency he discussed earlier on. How many people still use Myspace versus Facebook? How many Facebook or LinkedIn wannabe’s have come and gone? Carey concludes that the traditional initiatives of choosing, attending, paying for, and preparing for college will change dramatically due to the Internet and technology. The era of attending colleges that didn’t teach anything is over and neither parents nor students should pay huge sums for services that the Internet can offer for free. High schools will allow students to make evidence of their learning machine-discoverable; more people will build online portfolios of digital badges and other credentials to attract the attention of universities worldwide. The implication of global discovery through the Internet means that casual students will not be in demand like those who learn. The future of education involves substantially more academic work. Students will only borrow money for an education that will yield a return in the job market and allow him or her to repay those loans. Lastly, colleges and universities will succeed based on their ability to create an economic model that supports the cost of doing what they’re good at and nothing else. High-quality, digital learning environments will increase the productivity of academic labor. Colleges that continue to charge the same tuition as elite institutions are due for a hard fall. If they don’t change, competitors more effectively utilizing technology will overtake them. Colleges need to think more like cathedrals and reach out to more people and charge them less. I agree, but again, this point effectively promotes the concept of larger, more scalable institutions, not smaller ones with personal communities unless the institution can charge more to cover the costs of uniquely serving a smaller community. 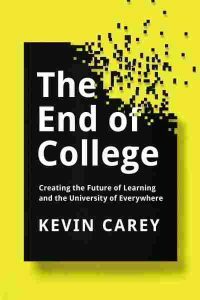 I ordered copies of The End of College for my board members and management team. 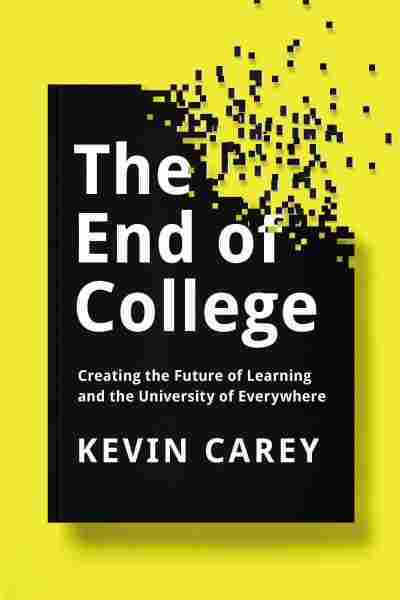 I don’t know if all of Kevin Carey’s predictions will come true in this generation (as he writes), but believe that he makes understanding the implications of technology to higher education easier than many other authors on the topic . While our more than two decades of experience in offering affordable online courses and degree programs at American Public University System provide us with a head start on many of the “hybrid universities,” Carey’s narrative about the other technologies is important for all to understand. 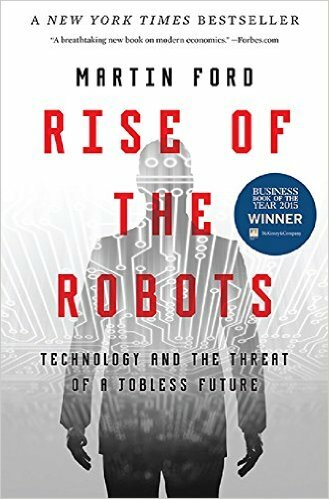 If you are seeking a well-written, thought-provoking book about higher education disruption through the adoption of technology innovation, I recommend The End of College.